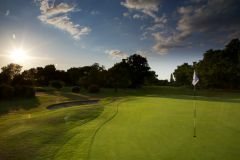 Fulford Golf Club celebrated its centenary in 2006, and is one of the York area's most prized golfing assets. The welcoming club is extremely hospitable, offering its superb championship course to the area's visitors. During your York golf tour, you will enjoy a course that was devised by Major Charles Mackenzie, brother of golf's most revered architect, Dr. Alister. Fulford now reflects the move to the present site in 1930 - in preparing for the move, the club sought the advice of the legendary James Braid to choose a suitable site. The course has in the past hosted some prestigious professional events; who could forget the image of a youthful Bernhard Langer hoisted 20 feet up a tree to play his third shot to the 17th during the 1981 Benson & Hedges International Open? This European Tour venue is no longer on the regular roster, but it remains one of the best loved traditional golf clubs in the north, and is the perfect option for a golf tour of York.